For the past few months, we’ve been very excited to partner with the Amah Mutsun Tribal Band in presenting a series of talks, walks and workshops that highlight the past and present of the Native Peoples of California’s central coast. One of our exhibit halls, the Ohlone room, is permanently dedicated to exhibiting artifacts that offer insight into this part of history. These include several large mortars and pestles which were used to pulverize or smash natural materials. They were especially useful in processing larger food substances, like acorns. November’s Close-Up expands this picture by showing another type of stone tool that hasn’t been on regular display: a metate, or milling stone. The word “metate” is from the borrowing of the original Nahautl word, “metatl.” Metates are used with a mano, or handstone, to apply pressure to the materials that one is milling or grinding. When we think of metates, we typically think of the traditional Mexican, footed metate still widely used today to grind corn for masa. In the Museum’s Hecox collection, we have a typical example (pictured below) of this style that was collected in the 1880s. Both metates and manos, and mortars and pestles, are types of querns: the broad term for a hand mill used for grinding materials. 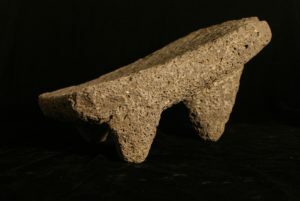 Metates often take the form of rectangular slabs with a single shallow depression on one side, across which a mano was pushed in a back and forth motion. However, these traits varied across Native Californian tribes. Due to their shape, metates can be hard to distinguish from natural rocks. Indeed, the nature of a rock was a big factor in whether to use a stone as a tool (softer stones make it easier to mold an impression, for example). The first metate depicted in this month’s Close-Up is from the Soquel area, and you can see that is has a flat work surface across the top. 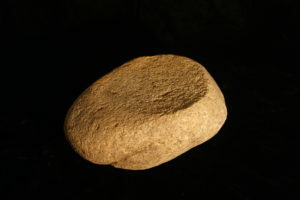 Metates used by the Ohlone were sometimes used on both sides, and often with the lesser-used, circular motion of grinding. While metates were often used for milling smaller seeds, they could also be used to process other plant materials and even meat from small animals.